Hundreds of Indiana University administrators, faculty, staff and students, alongside members of the Bloomington community, gathered Monday to honor the Rev. Martin Luther King Jr. during the university's annual MLK Leadership Breakfast. During the ceremony, five special participants were honored with the Building Bridges Award, which recognizes people who capture King's vision, spirit and leadership. "The recipients of these awards are students, faculty, staff, and members of the community who have embodied the vision, spirit, and legacy of Dr. King through their selfless work and actions," said James Wimbush, vice president of diversity, equity and multicultural affairs and dean of the University Graduate School. 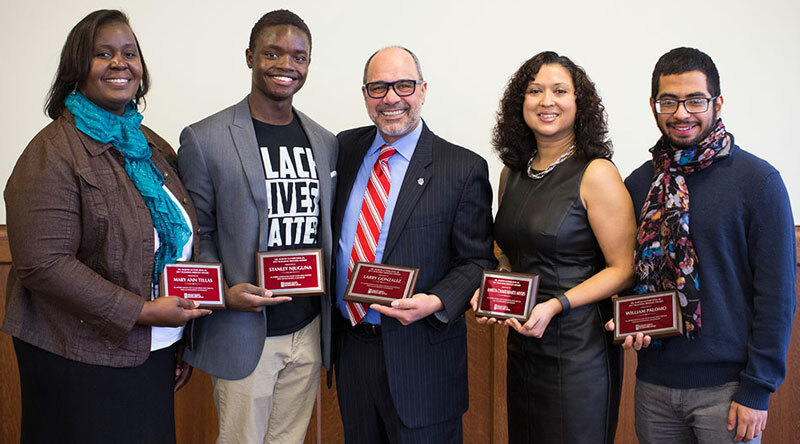 "Each of the recipients has demonstrated passion for change, dedication to empowering others and leadership in promoting the values of unity, equity and diversity at Indiana University and in the city of Bloomington. "All five of our honorees have truly exemplified the theme of this year's celebration: 'The Power of One.' Each of them has demonstrated that through courageous and compassionate work, we can improve the lives of others. Not only have they furthered the causes of diversity and inclusion on campus and in the community, but they have emulated the values that Dr. King lived by in doing so." Stanley Njuguna: a sophomore majoring in law and public policy, is this year's undergraduate recipient. Njuguna is heavily engaged in campus and community activism; is the founder and leading member of the IU Students for a Democratic Society; member of the IU Policy Debate team; conflict mediator for Students Against State Violence and a protective order assistant/legal advocate for Middle Way House. He describes himself as a lover of riveting documentaries, science, dogs, anything with melody and rhythm, dry humor and, of course, progress. Willy Palomo: a Masters of Fine Art student in poetry and Master of Arts student in Latin American and Caribbean studies, is this year's graduate student recipient. The son of two undocumented immigrants from El Salvador, Palomo graduated with an English and honors degree from Westminster College in 2015, where he received the Trustees' Character Award for his work teaching at local Title 1 schools. At IU, he teaches creative writing; helps lead the UndocuHoosier Alliance; runs the Bloomington Poetry Slam and writes books reviews for Muzzle Magazine. In 2016, he was named the runner-up Latin@ Scholar at the Frost Place Conference on Poetry. His poems are published or forthcoming in "HeArt Online: Human Equity Through Art," "The Wandering Song: Central American Writing in the United States," and more. Amrita Chakrabarti Myers: a Ruth N. Halls Associate Professor in the Departments of History and Gender Studies, is this year's faculty recipient. Myers earned her doctorate in U.S. history from Rutgers University, specializing in African-American history and women's history. A historian of the black female experience, she is interested in race, gender, sexuality, power, freedom and citizenship and the ways in which these constructs intersect with one another in the lives of black women. Myers is an author and recipient of several awards including the 2012 Phyllis Wheatley Book Prize from the North East Black Studies Association; the 2012 Julia Cherry Spruill Book Prize from the Southern Association of Women Historians and the 2011 Anna Julia Cooper-C.L.R. James Book Prize from the National Council for Black Studies. She is heavily involved on and off campus, helping organize a symposium a 2014 sympoisum at IU titled "Rights and Retrospectives: The Civil Rights Act at 50," and was lead organizer of "It's Not So Black and White: Talking Race, From Ferguson to Bloomington," a campus/community Black Lives Matter teach-in and justice fair that took place in 2015. Myers is a high-demand speaker and is regularly interviewed in the media. Larry Gonzalez: interim senior associate director of diversity, recruitment and outreach at IU, is this year's staff recipient. Gonzalez has been at IU since 1983 as part of IU Bloomington's Office of Admissions. Gonzalez has conceived multiple strategies and collaborated with other departments to improve the recruitment and retention of underrepresented populations on the Bloomington campus, even before attaining his current role as the senior associate director for diversity recruitment and outreach. He has received recognition from several organizations, including the Indiana Association for College Admissions Counseling and IU's own Groups Scholars Program. Mary Ann Tellas: a high school biology teacher in Indianapolis, is this year's community recipient. Tellas grew up in Bloomington and graduated from IU with a bachelor's degree in biology and a master's in science education. While at IU, she was mentored by the late James Holland, one of the namesakes of the IU Hudson & Holland Scholars Program. Tellas has carried on Holland's legacy through the summer science research program he started, helping scores of underrepresented minority high school students from across the state become exposed to scientific research at an early age. Due to her guidance, many of them have gone on to advanced degrees and professional careers in the sciences.